So lately I've been trying to do projects that can still be attributed to this style, but very simple and "neat". This time I decided to make a simple and elegant card. 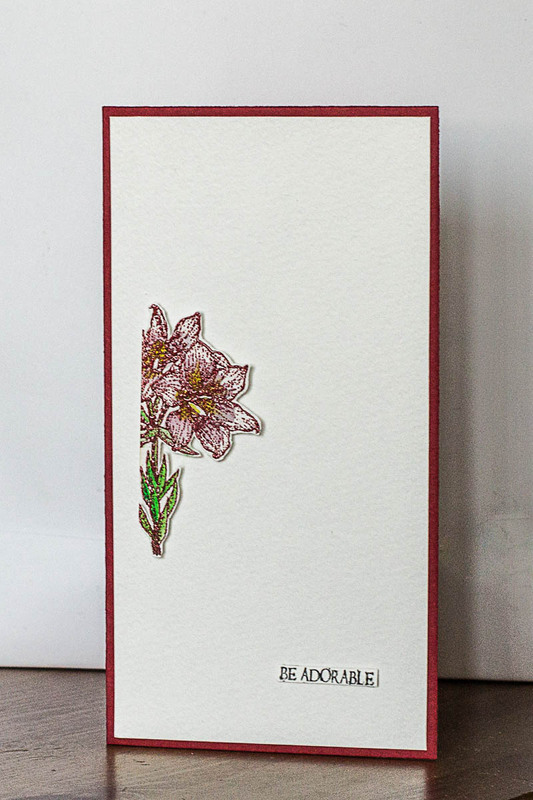 And if you noticed, I used THREE medias on such a small space - ink, embossing powder and watercolor (to color picture) - aaaaaannnnddd sooooo... ahahaha)))), this card is made in the mixed media style! 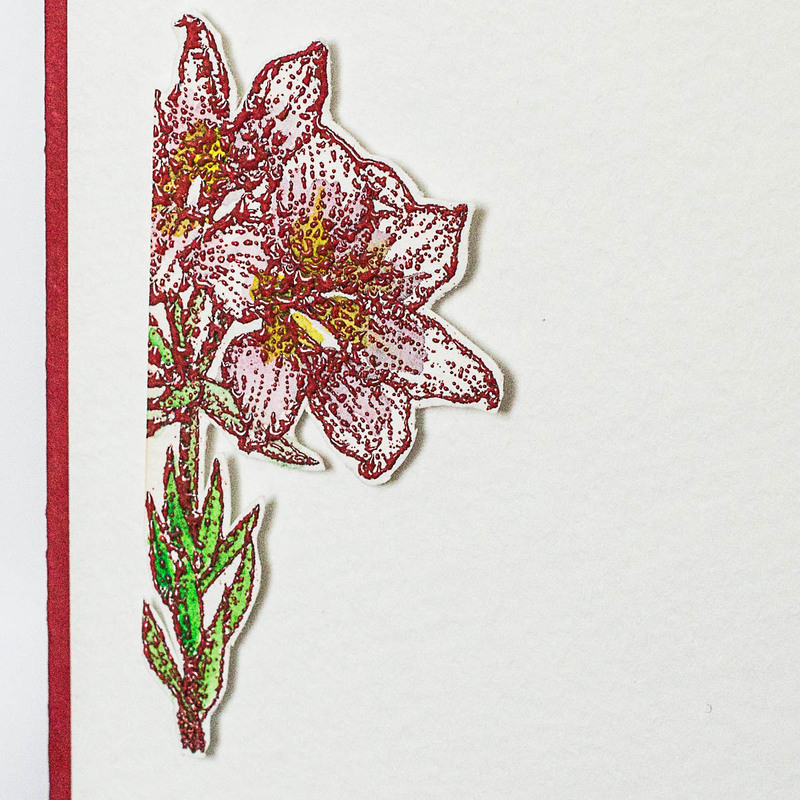 My red embossing powder is to large with rough particles, but this stamp is so slim and trim that image still got quite distinct! Hope you liked the simplicity and "modesty" of this card. 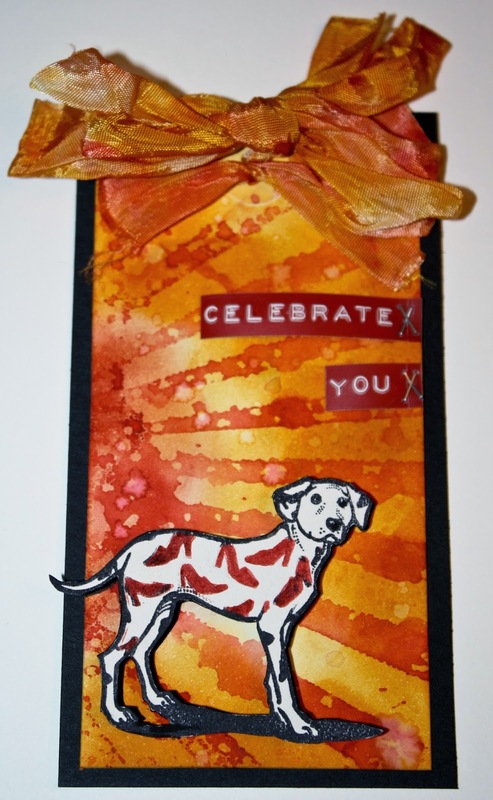 We have a 2nd post from the super talented Christina Anderson here for you today!! Tins available in thrift stores, on Etsy,import stores, etc. #1- Gather your supplies. (A) On white copier paper, print the large art doll stamp, minus the legs, and the bat wings in the corner of the paper. 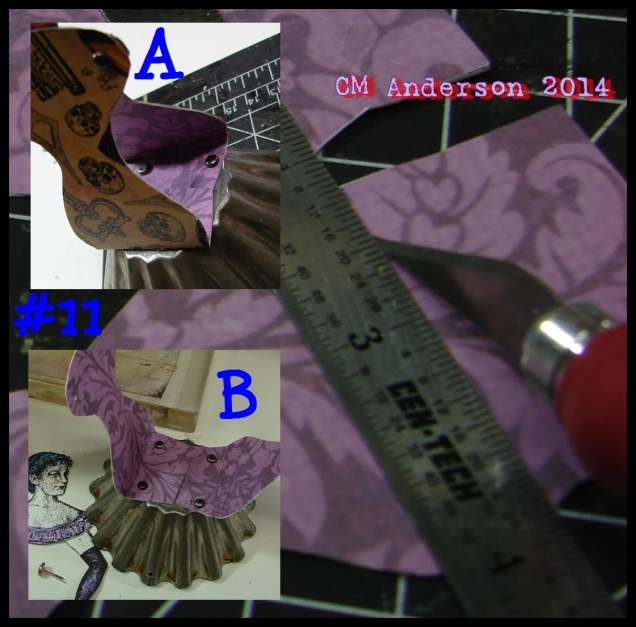 (B) Increase the size of the stampings to a total of 125%, print out on the heavy, white cardstock. Some adjustments may be needed according to your stamp layout, size of tins, intensity of printout. 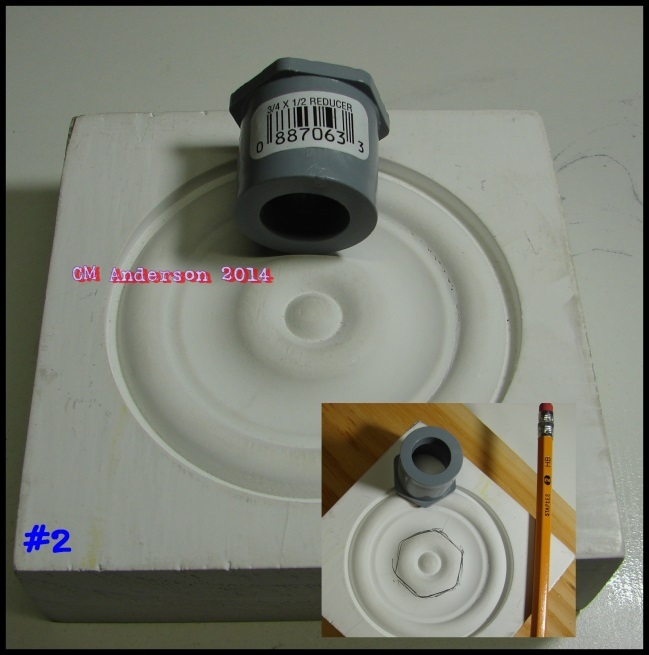 #2-On your wood block, measure and mark the center for the electrical reducer. Center and trace around the reducer. 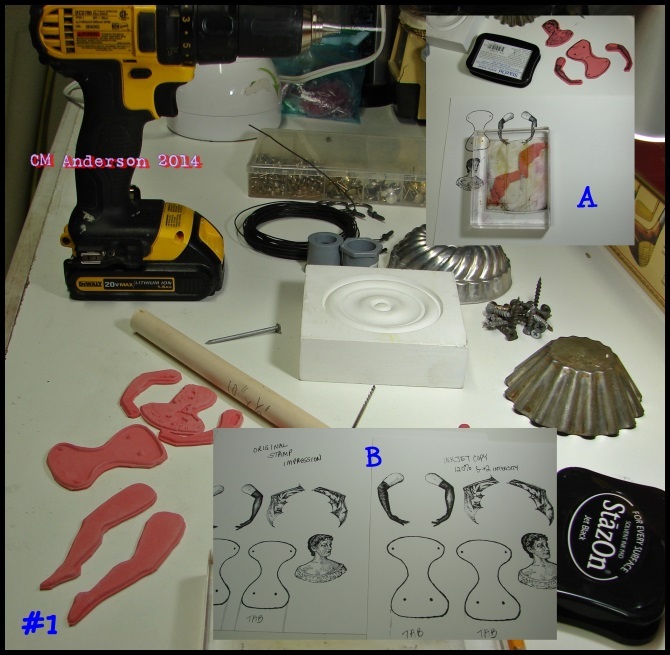 #3-Using the instuctions from the “Romp & Frolic” tutorial, take the variable speed drill with the 1/8” drill bit, drill a hole opposite each other on the sides of the reducer.Drill 6 holes around the perimeter of the reducer (where the points stick out the furthest). (A) Clean out the burs with your Exacto knife. (B) Nail the reducer to the wood block, use the rounded end of the ball peen hammer to tap the nails all the way down. (C) Set the dowel into the reducer, drill a pilot hole into the dowel using the previously drilled side holes as a guide. (D) Apply a generous amount of E-6000 to the pre-drilled end and set back into the reducer. Make sure to line the dowel holes up with the reducer holes. (E) Tap a small nail into each side of the reducer/dowel end to keep the dowel in place while the glue cures. Base/bottom tin- measure the edge of the tin for eight holes, evenly spaced. If this tin does not have a center opening at the top, mark for center. 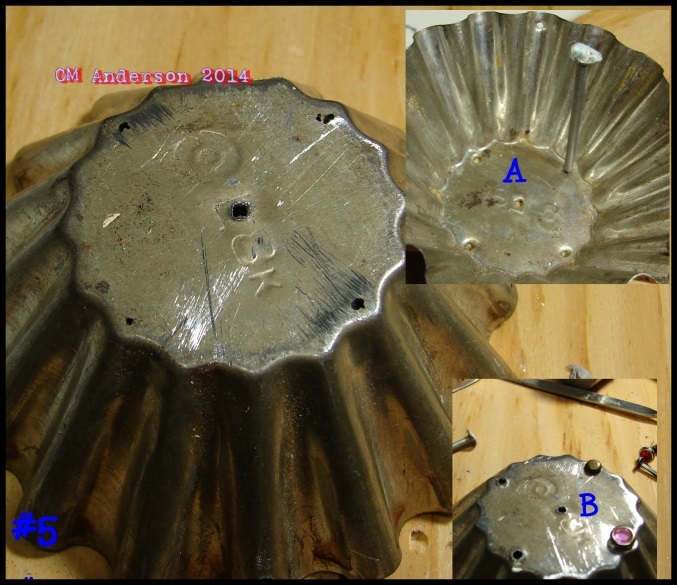 (A)The top (“skirt”) tin needs four evenly spaced holes on it’s edge and four evenly spaced holes on the flat surface in a square pattern, with a hole for center.Looking ahead at step #8- the square patterned holes on top, are centered over one of the the four edge holes! This is important to do for building this art doll. Use the large nail,hammer, and wood plank to punch holes through the tins. (B)-Use the needle file to smooth out the burs. (C)- Ream out the holes with the end of a pointy file and smooth out with the flat file, alternating, making sure that the holes are large enough to accommodate the wire brads, nails, and steel wire. 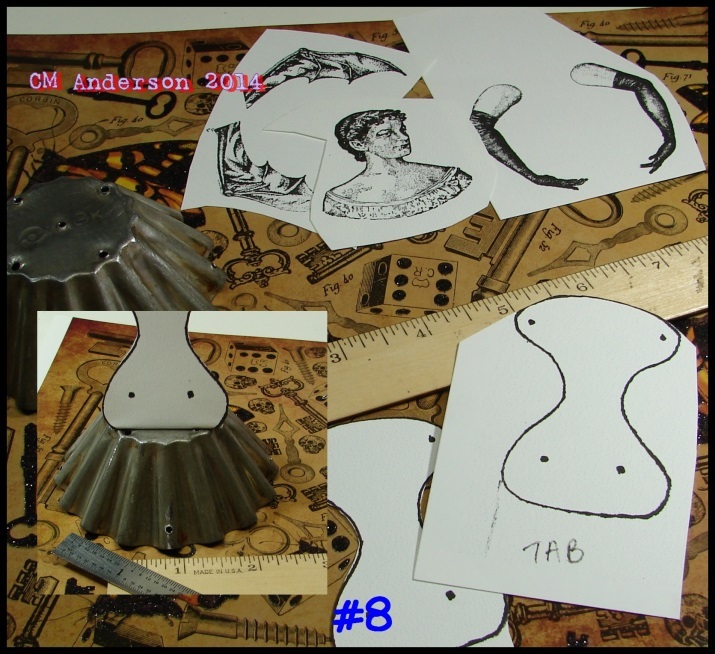 #5- Closer views of holes for “skirt” tin and dry fitting for brads. 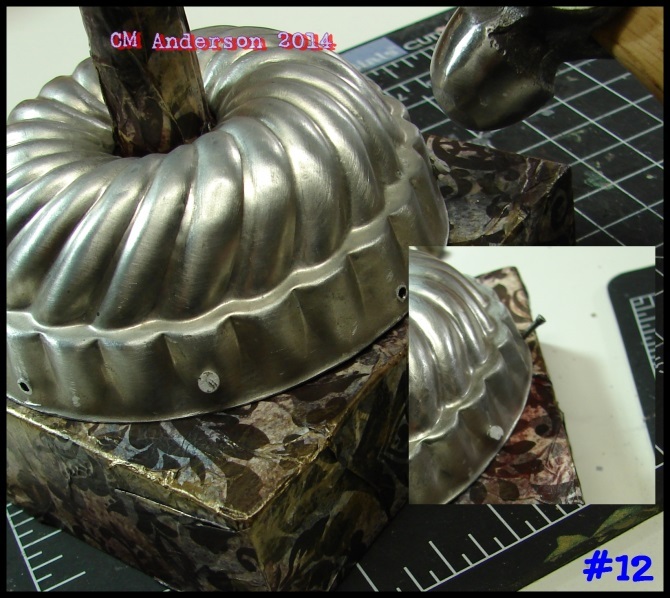 #6- For the “base” tin, enlarge the punched hole at the center top with metal cutting shear in a radial (pie slice) pattern. 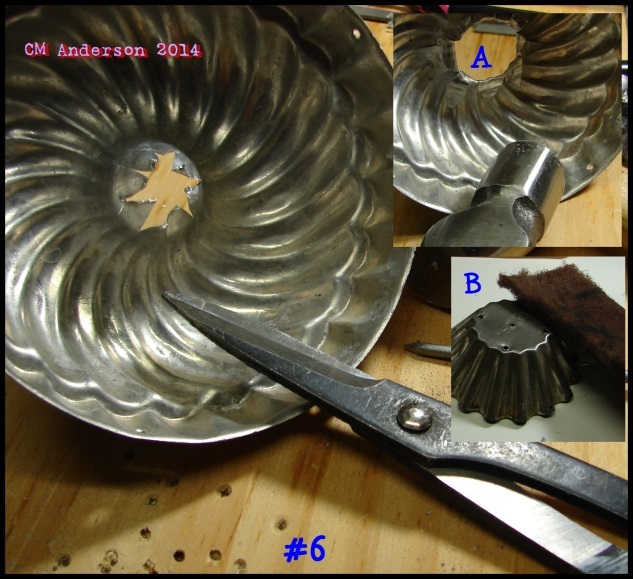 (A) Use the round end of the ball peen hammer to gently tap the “slices” inward, then tap the slices closer to the tin. (B) Take the 3M scrubby and gently clean the outsides of your tins. #7-Crinkle and re-flatten the tissue paper. Collage the tissue paper onto the dowel and base of the doll. 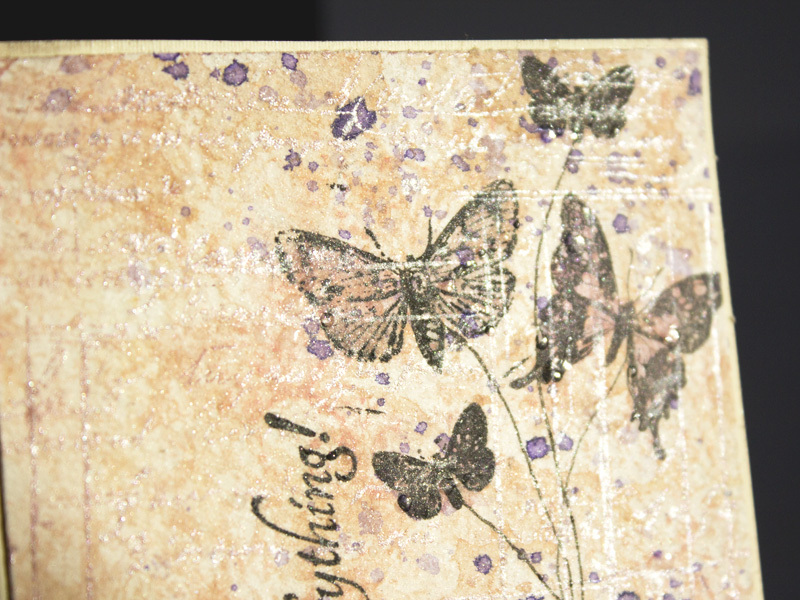 When dry, use acrylic paint washes to enhance/distress/age the tissue paper. Set aside to dry. 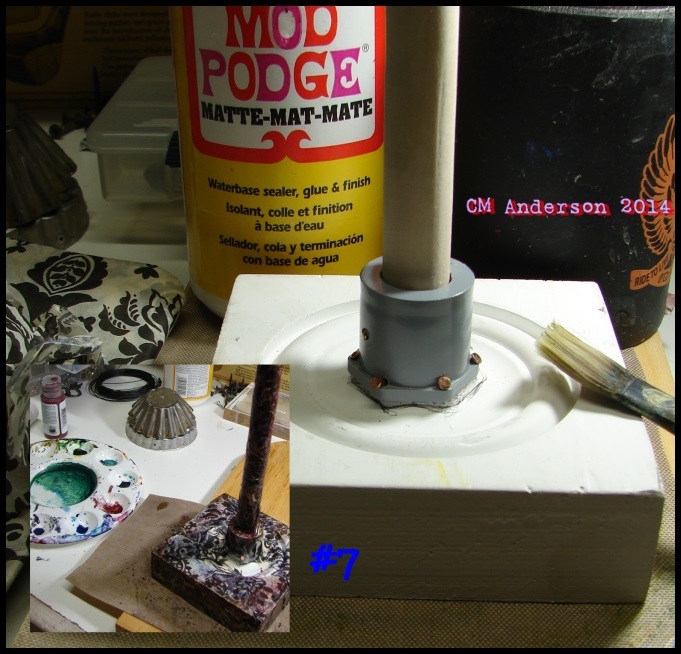 When dry, remember to glue paper to the bottom of the base, then sign and date your artwork. 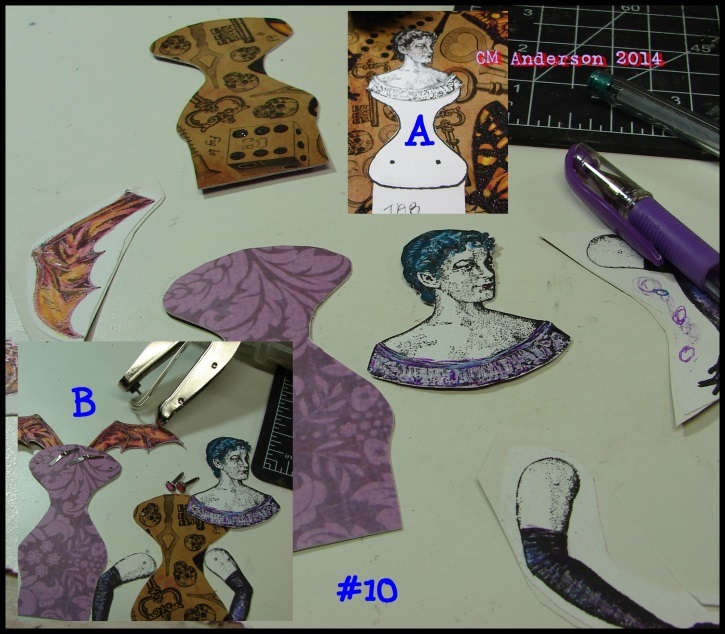 #8- Cut out the enlarged, cardstock stampings, taking care to leave a 1” long “tab” at the bottom of the torso stampings. In the inset of #8, I lined up where the torso tab needs to be folded to have room to punch out holes for attaching the doll. Mark/measure that crease for further reference. 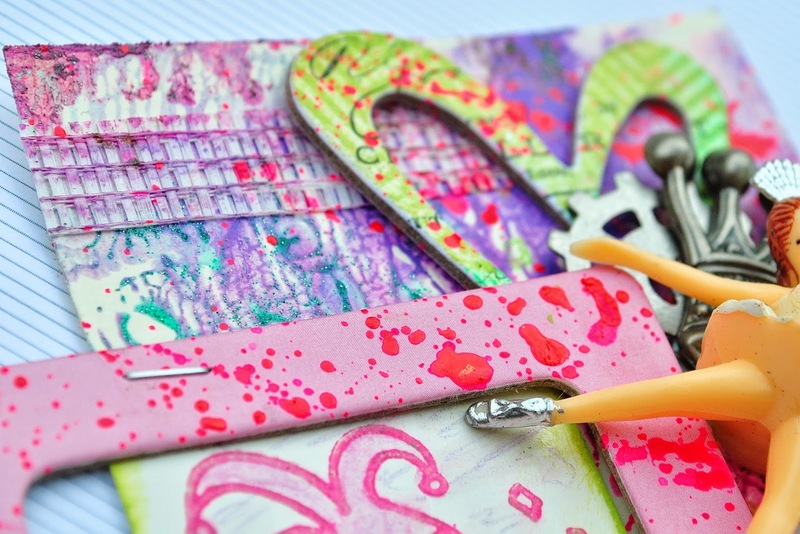 Use the permanent glue stick to FIRMLY attach all 7 sections to the BACK of the heavyweight piece of scrapbook paper. 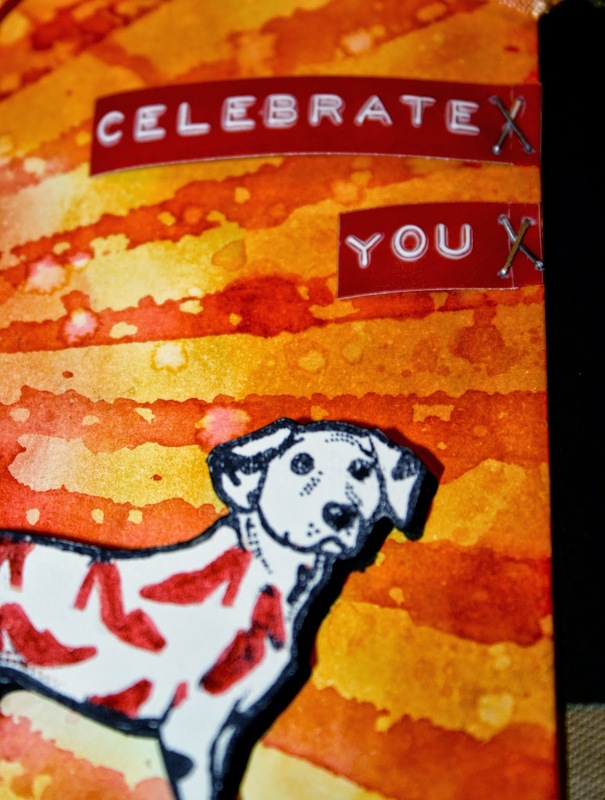 Use a bone folder, brayer, etc, to make sure the pieces are well adhered. Step #9 has been condensed and included into Step #10-so, no, you aren’t going crazy! #10- Cut out the pieces fron the scrapbook paper. 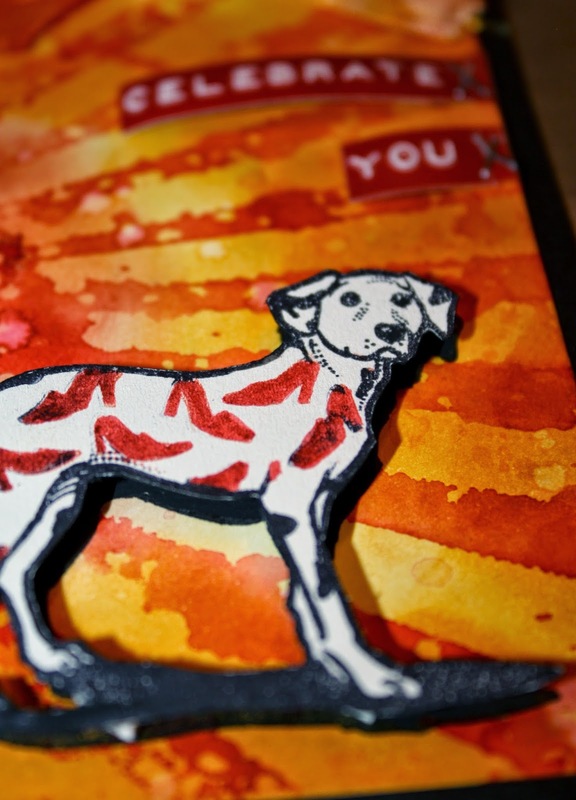 Glue the lightweight scrapbook paper to the exposed side of the torso sections; cut out. I colored in the head,wings, & arms with pencils BEFORE I trimmed them. Better grippage while coloring! (A) Line up the head section on one of the torso sections, punch shoulder holes with the 1/8” hole punch. Align the two torso sections with the “insides” together (purple paper on this doll) and punch through the previous shoulder holes. (B) Select the position for the bat wings, punch holes and attach wings to shoulders with the brads. #11- Remember the crease measurement from Step #8? Time to use it! Line up both torsos at said measurement, set a ruler on top of the INSIDE of the torsos at that measurement, THEN, veeeeeery carefully, using the BACK of the Exacto blade, score a crease into the paper! Voila! (B) Crease & trim the tabs to fit on the skirt tin, attach with the mini brads. I had to punch another hole in this doll as it was a bit “twisty” when I dry fit the shoulders together. #12-Slide the large hole tin on to the doweled base. Line the 8 holes at the edge as best as you can with the side centers & corners of the wood block. The CORNER HOLES are nailed first! If necessary,drill shallow pilot (starter) holes at an angle through the tin hole through to the wood block.Tap these four nails in until they touch the surface of the tin. The 4 nails that center the block sides are tapped in about ¾ of the way. These are anchors for the steel wire. 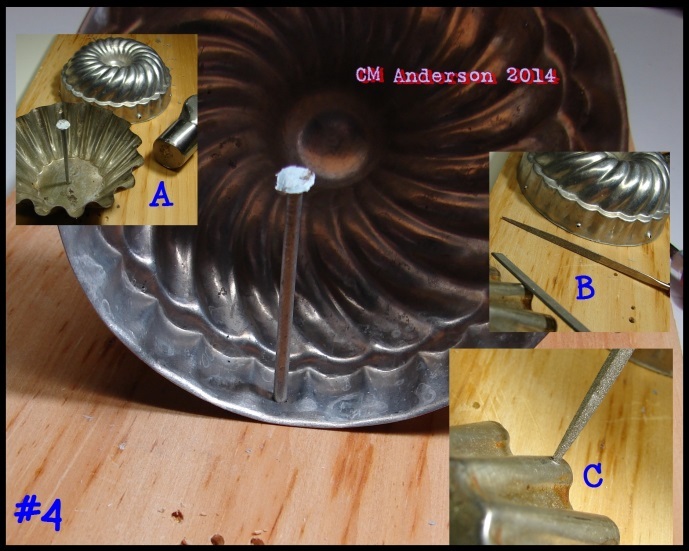 #13-(A) Use the awl or upholstery needle to punch a hole through the cardstock on the tin skirt. Make sure this set-up will accommodate the wood screw without being too tight, otherwise the wood dowel may split. Ream and debur with the needle files from step #4, as needed. (B) Find the center of the dowel at the top end, carefully drill down deep enough to fit the wood screw later. 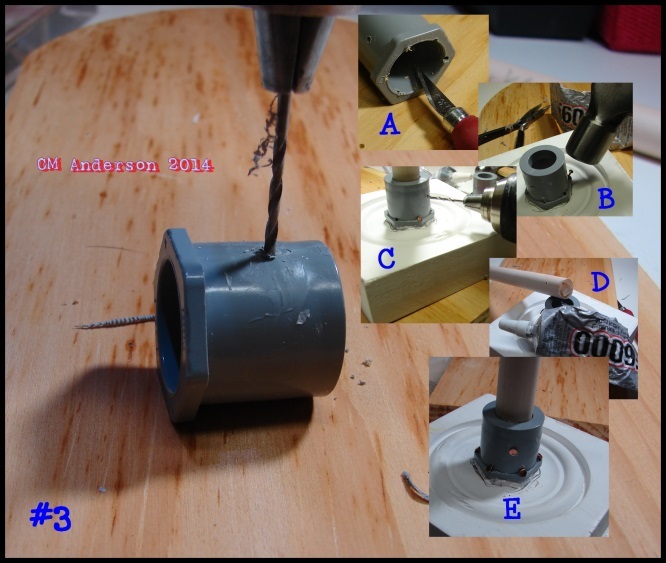 (C) Hand start the wood screw through the washer and skirt tin BEFORE setting into the dowel end. Add a generous amount of E-600 to the dowel end.Fit the point of the screw end into the dowel hole, tighten down sloooooowly with the Phillips head screwdriver. Now,in this order, attach the paper doll head, torso front, arms and torso back together with the mini brads and get ready for some (messy) steel wire FUN! 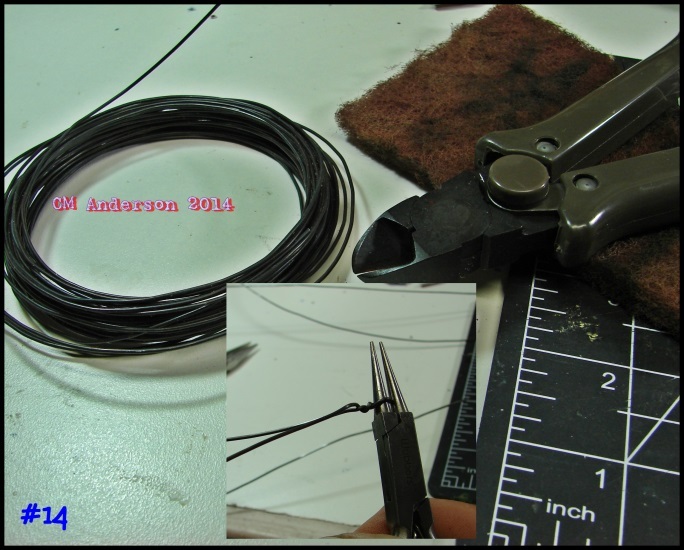 A little info on “dark annealed steel wire”…..
First, it is my all time favorite staple to use in my art. 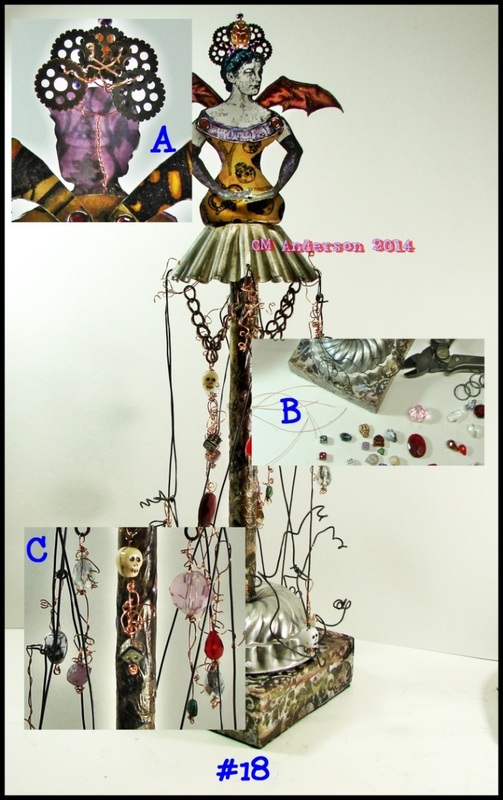 Jewelry,collage,assemblage,this inexpensive,forgiving,lowly construction material, cannot be BEAT! However, two minor drawbacks, it takes stronger hands to use, so pliers are the way to go for shaping. Because of the annealing process to make it pliable, it is oily when you first get it & covered in carbon powder. Use a 3M brand kitchen scrubbie to clean it off before shaping and keep lots of handwipes around! 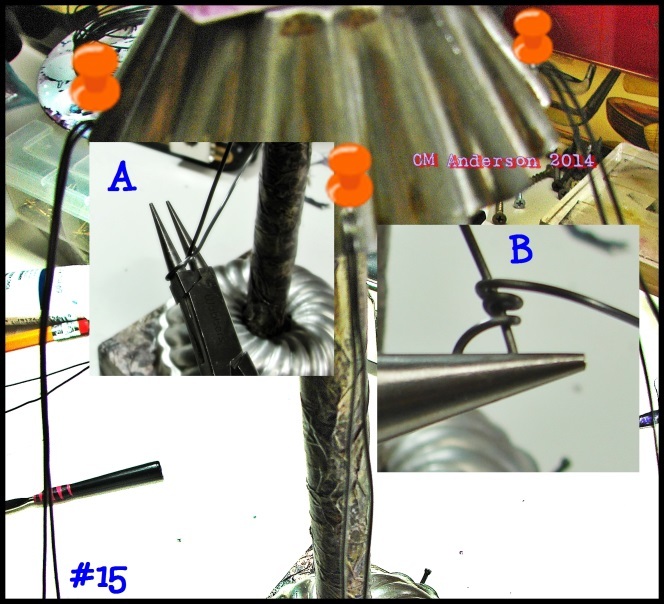 #14- With the side cutting pliers, cut four 30” lengths of the annealed wire. Fold the scrubbie in half and pull the wire through the fold a few times to remove the oil and carbon. Take each length of wire and make a large, even ended “hairpin” shape. Using the round nose pliers, tighten the “U” shape bend down to the pliers and the roll the pliers around twice to twist the hairpin together.Repeat with the other 3 hairpins. #15- Thread each hairpin through the back side of a hole on the tin skirt edge ( the loop will be on the inside of the tin skirt). 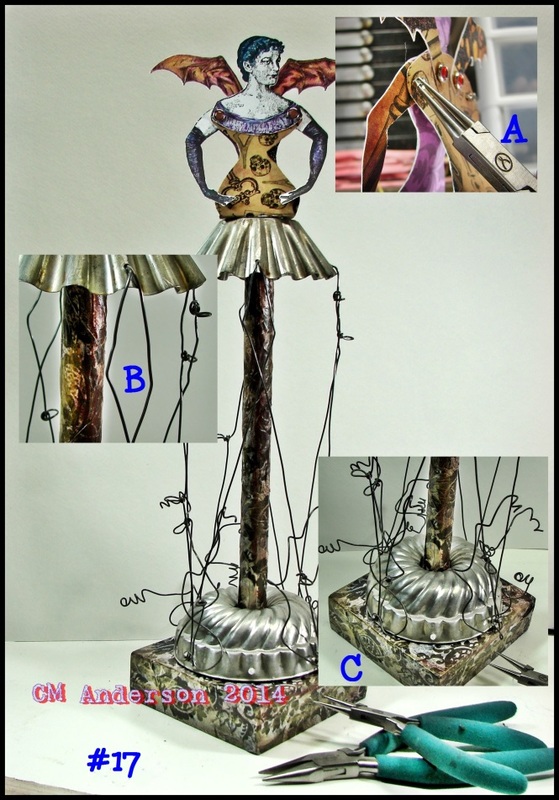 (A)At varying lengths down each of the 8 wire “tendrils”, make a loop with the round nose pliers to hang embellishments from later. (B) Here you can see where the longer end of the wire is wrapped around the back part of the loop. Straighten out the tendrils after you have completed the loops. 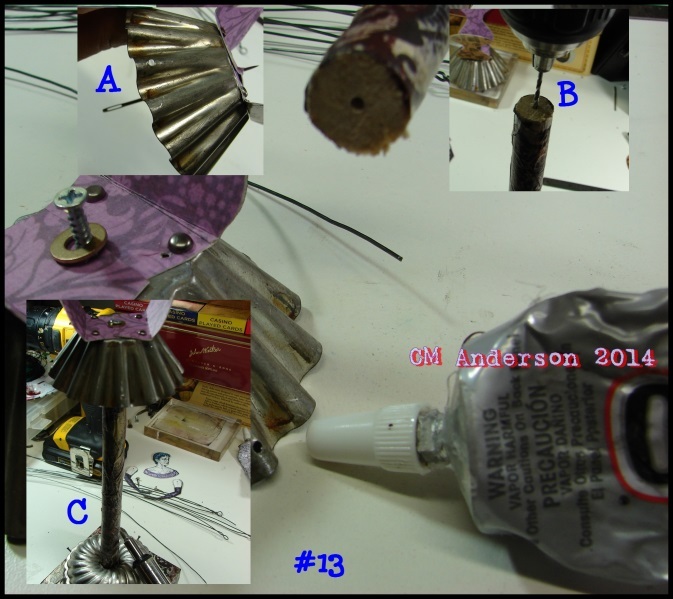 #16- (A) Take a tendril and wrap it once around a corresponding nail that you tapped into the tin/base. From that point, take the next tendril and wrap it around the next nail. (B) There should be four long “V”s where the wire meet at each nail. Throughout this process, keep checking the balance of the doll at the top. You can unwrap the wire, straighten with the chain nose pliers, and rewrap to keep the top from being wonky. #17- (A) I curled the ends of the brads at the doll’s shoulder with the round nose pliers. It was aesthectically more pleasing than leaving them flat. (B) The doll wass a bit tippy looking still, so I bent some of the wires to form a diamond sillouette and create some tension where,structurally, there was a little slack. (C) With the round nose pliers, create some little,vine-like, curls. Weave the wires back through each other to give the bottom of the doll a fuller look. No rules, just play! 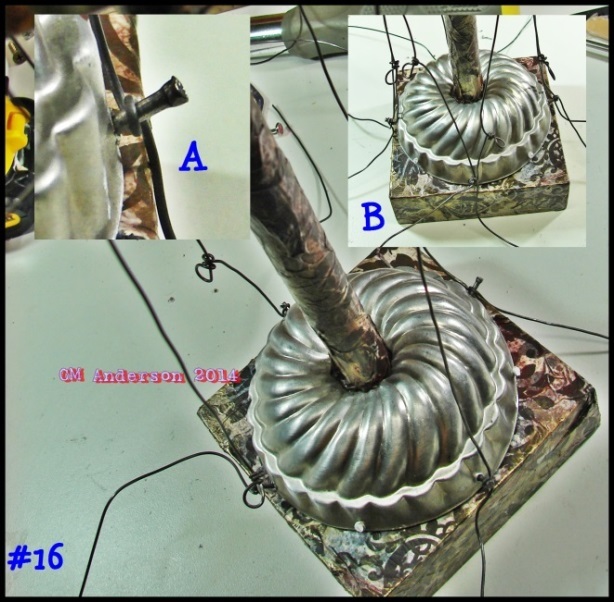 This wire can take a lot of abuse before it breaks, unlike other metals. eye pins, strung a bead, and then hooked them through the steel wire loops. They are closed off by loosely wrapping the end around the “dangly” part. Some of the ends were long enough to make some vine-y ends. I wired up some chain to the loops of the hairpins that were put through the tin skirt edge and hung some extra beads from it. 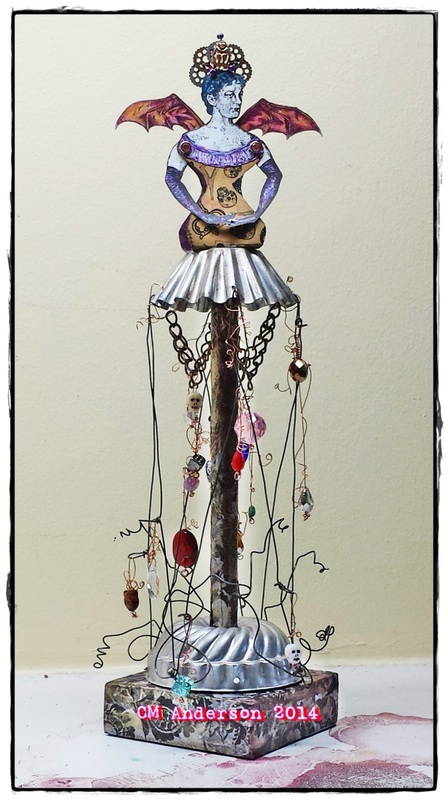 You can use ribbon, thread, charms, bits of paper ephemera, etc., to fill out your doll’s skirt. It’s however you feel she needs to “be”! Please contact CM Anderson, ChristinaAndersonArt@gmail.com for further inquiries. It's Amy here today to share a blast from the past, the HERE stamp. I had fun getting this funny Mardi Gras gal ready for a carnival atmosphere, on this layered ATC (I'm clearly big on those these days). 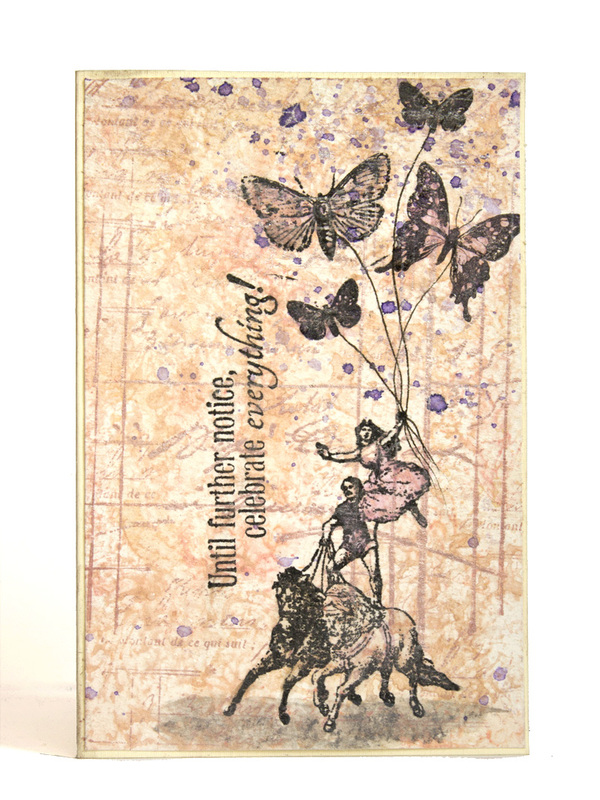 I used my gelli plate to make the background, using purple and green paints, and neon pink Hero Arts ink, spreading it with a brayer, over a stencil. I then added some drywall tape, cut down, for texture, and rolled the brayer over the top. 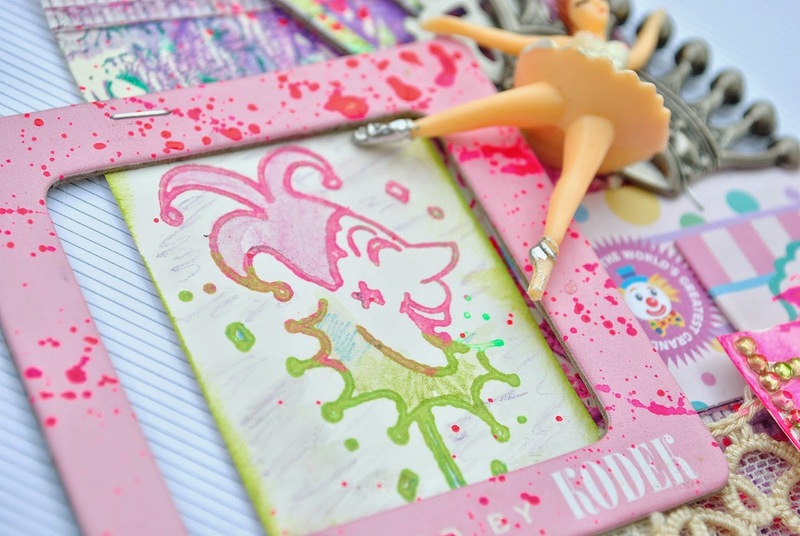 For the ATC card with the Mardi Gras Mask stamp on it, I stamped with IMAGINE Crafts Neon and Memento inks in Pink and Green shades, and colored it in with watercolor pencils. The background is shaded with purple watercolor pencil. 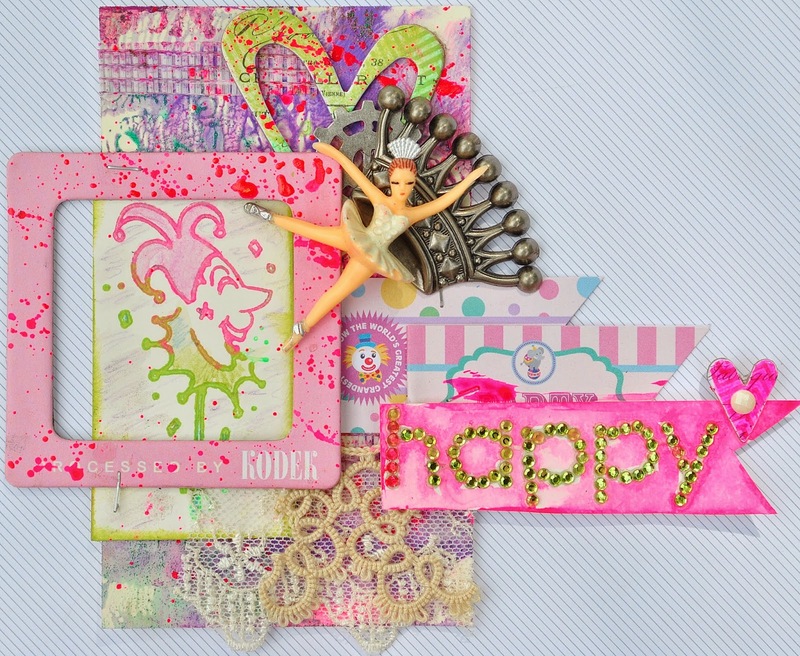 Finally, I added layers of embellishments, including the vintage plastic ballerina. I tried to keep everything light and fun, using some cupcake flags from Ruby Rock-it for little banners. Thanks for having a look today, and I hope you enjoyed taking a trip back in time, to find a new stamp! Today I invite you to celebrate everything with our Blast from the Past! 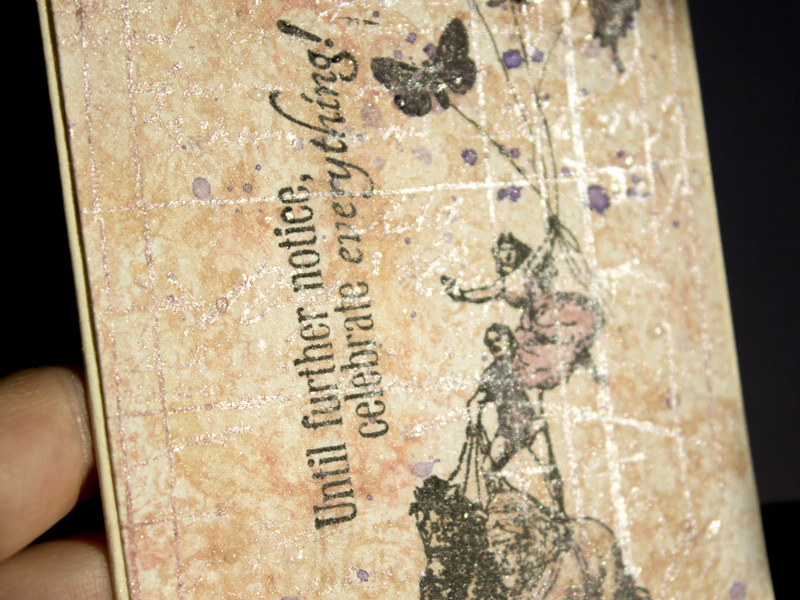 I got a wonderful Circus Acrobats stamp :) It's so cute! I just love the shine of pearl powder! 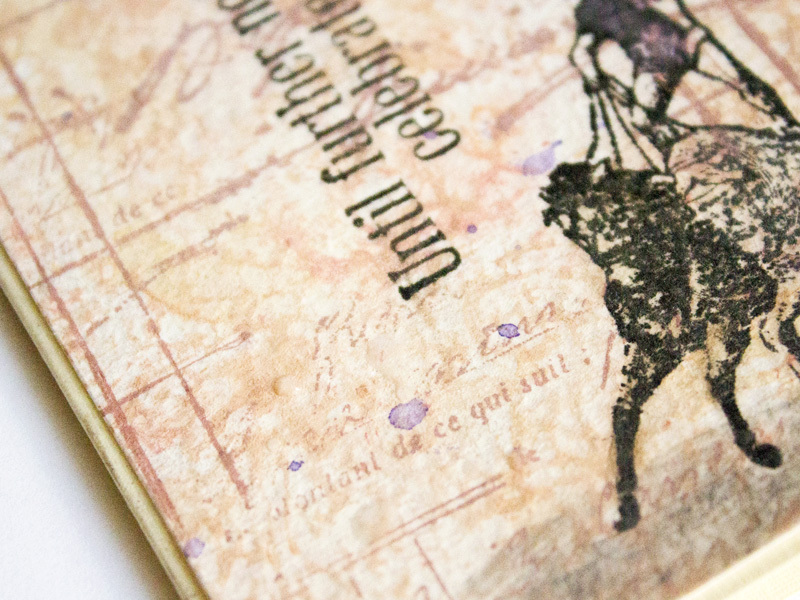 Hi guys, It's Tera again here to share my fun blast the past stamp project with you! This was such a fun challenge for me! and I hope it will inspire you!! I love that this stamp can be used in so many situations, from birthday cards, to girls night out, dog lovers, and just about anything! For my project I thought I would do a piece on celebrate who you are and your own style! I made two so i could have options to which I liked best when finished and because it is so fun! At this stage you are almost done!! add your pop dots, and staple down your quote! If you are pleased with the look attach your back with Miracle Tape and Enjoy!!!! I Hope you enjoyed this tag inspiration!! I had so much fun making this piece and I know that I will have to use this Awesome stamp for some more super fun projects! !